Mexico is a well known global collaborator in trade, culture, and research initiatives. For this reason, Intellectual Property Rights are protected at any means necessary. As an international partner in trade, Mexico has a history of participating in many international FTAs that promote IP protection. Specifically, Mexico is part of the Universal Copyright Convention and the Berne Convention where foreigners are guaranteed protection for their work. Currently, NAFTA has a Trade Related Aspects of Intellectual Property Rights (TRIPS-Plus) that was first initiated by the World Trade Organization (WTO) in 1995. TRIPS-Plus sets high standard and guidelines for patents in WTO countries, extending terms longer than the 20 year minimum, restricting generic competition, or limiting the use of compulsory licenses. One other addition to the TRIPS-Plus is the protection of data exclusivity, specifically for pharmaceutical test data. 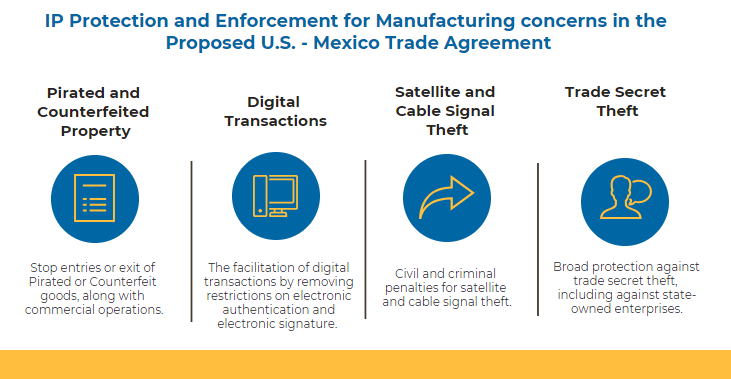 The new agreement between the U.S. and Mexico contains a modernized and strong chapter on Intellectual Property Protection. The modern approach would apply standard enforcement of the trade provisions including criminalization. Both countries agreed that the standards of the new treaty should cover piracy, counterfeiting, camcording, trade secret theft, and some signal thefts. Broad protection against trade secret theft, including against state-owned enterprises." "Prohibit customs duties and other discriminatory measures from being applied to digital products distributed electronically (e-books, videos, music, software, games, etc.). Limit governments’ ability to require disclosure of proprietary computer source code and algorithms, to better protect the competitiveness of digital suppliers." The partnerships and global treaties that have enabled Mexico to be known as a safe place for industry intellectual property rights continue to grow as more emphasis is being put on modernized ways to deal with IP protection. 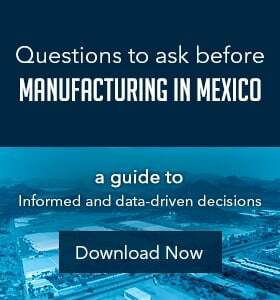 The new and improved proposal that protects these rights is just one more reason why manufacturers should trust their operational journey in Mexico.